Textile & fiber arts (imported yarns, crochet embellishments, lace, trim, fabric). Incorporating and manipulating photographs is very easy using MS Word. (You do not need Photoshop, which can be complicated.) The following directions are for a MAC, but if you have a PC the process should be similar–consult the HELP menu for “formatting images.” If you have photographs scanned in JPEG format (.jpg), you can copy and paste the images in any Word document (.doc or .docx). Once pasted in the document, click on the image and pull down the FORMAT menu to PICTURE [On a PC, just right-click and choose “Format Picture”]. Under PICTURE, you crop the photo (remove white borders or other unwanted parts of the photo around the margins) and improve the quality of the photo (enhance contrast, increase brightness). Under LAYOUT, you can create a montage of several photos to create an interesting collage and save space. Click on one photo first, then under LAYOUT, click either “In front of text” or “Behind text” and repeat procedure for each photo on the page. If you use “Behind text” a part of the photo can be hidden behind another. If you used “In front of text” the photo will overlap another. Then you can click, hold, and drag each photo around on the page until you have your desired collage. I have studied Asian ceramic and metal arts, I use Asian art in my teaching, and I have curated museum exhibits on Asian art. If I had the time and money, I would definitely go to Australia!! There is a wonderful company, Stamp-It, which produces stamps and papers different to what we have here in the US. Unfortunately, this company does not sell its products in North America, and the Australian government’s postal rates make ordering on-line quite expensive. Occasionally, I buy Somerset Studio. I have collected postage stamps and coins since childhood. I continuously search for vintage photographs (1870s-1940s) of women and children to use in my artwork (I print from electronic scans of original photos). Art is a form of language and I like to communicate social messages in my collages and ATCs. If I see interesting postage stamps with significant or thoughtful messages, or inspiring vintage photographs, I will use them as a basis for creating a collage. I have never taken an art class; I am self-taught. I have a good background in the history of ancient art and Asian art. I am married and we take care of my mother, a Chihuahua, and a gray tabby cat who plays hockey with my wood-mounted stamps. We have lived in San Francisco for 23 years. Printing: All images printed with an inkjet printer. 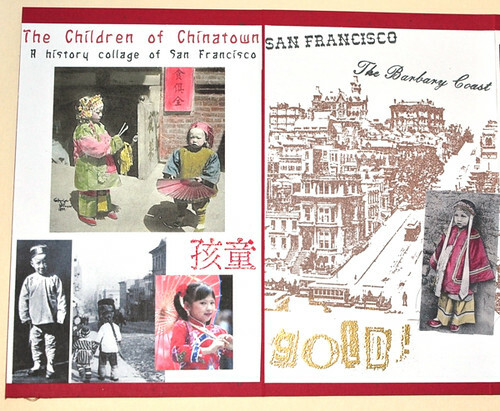 The 1899 photo of the girl in Chinatown on page 2 was printed on printable fabric. 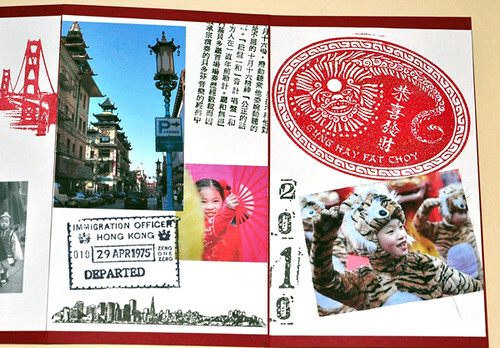 The photo of the boy in a tiger suit in the 2010 Chinatown New Year parade on page 6 was printed on printable fabric. All other images printed on 110 lb cardstock and backed with 80 lb red cardstock. 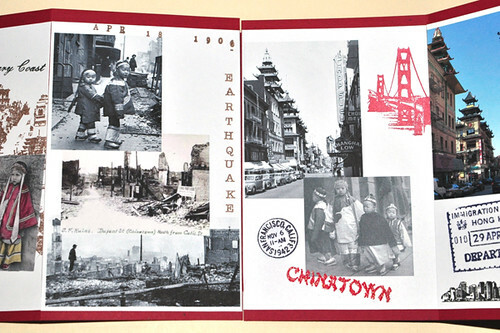 (Page 1) Title page: Chinese character stamp for “child” by Book of the Month Club, Inc.
(Page 2) San Francisco in 1890s: Cable Car Scene by Postmodern Design, “San Francisco” and “Barbary Coast” from the Frisco Slab by Postmodern Design, “GOLD!” collage letters by Stampin’ Up. (Page 6) Chinatown 2010: Chinese New Year stamp by Judikins, “2010” collage numbers by Stampin’ Up. Congratulations, Linda, on being SAM! Your project is wonderfully creative! Congratulations on being awarded SAM of September. Great project! Congratulations Linda! Well deserved!!! Hope you will enjoy your month in the lime light!! Loved your interview and your project is amazing! Thanks for the wonderful tips and the details on how to create your project. . .you rock my friend!! love the project Linda, the tips so helpful can’t wait to try it.